Cupcake hardware drawer pulls set of 4. These are simply the sweetest! 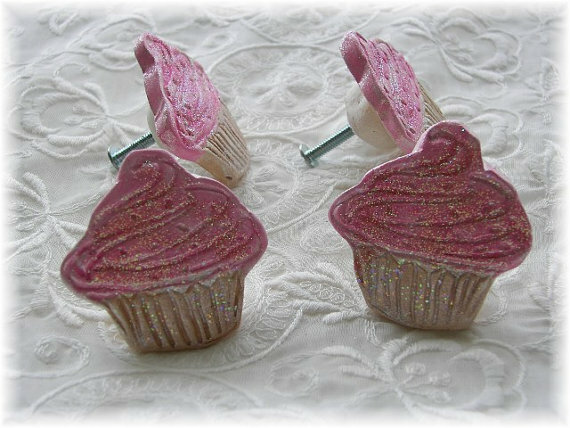 Cupcake drawer pulls in your favorite flavors. Now serving strawberry, chocolate, lemon, vanilla, or lime. Shown in set of 4. They measure 1 3/4" across at widest and 1 3/4" high. Available in other quantities or colors too!! Just add your favorite color when you purchase or convo me Each one is Handmade by me. I apply several layers of color, and glazes, the apply glitter for the finish. They attach onto your favorite drawer or item with a standard sized hardware as shown.